George Kittle has followed Kansas City’s Travis Kelce throughout the past three years. The favor has recently been returned. 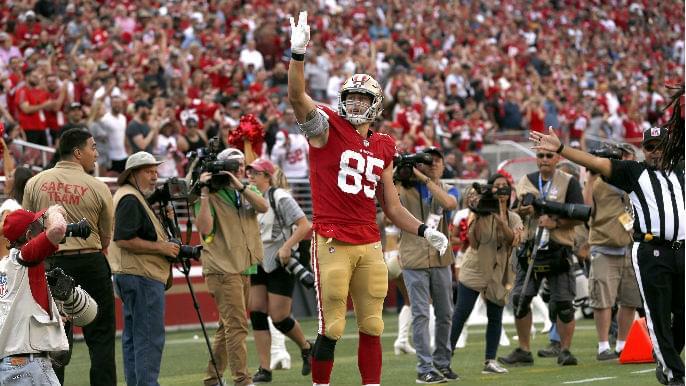 Life has changed for Kittle during his breakout sophomore campaign. After his four-catch, 108-yard performance in Week 9, the 49ers tight end now sits at 692 receiving yards, 13th in the NFL and trailing only Kansas City’s Travis Kelce for all tight ends. When Kittle was asked Monday how his life has changed, he talked about his growing friendship with Kelce. Kelce tweeted at Kittle after seeing the video of him at his locker, talking about the Kelce follow-back. Kittle said he previously commented on one of Kelce’s tweets, and the two exchanged messages — which presumably happened in the below series of tweets. The two met in person when Kelce introduced himself prior to the 49ers-Chiefs matchup in Week 3. They talked for a bit, according to Kittle. They will likely run into each other in the future at Pro Bowls, should they continue to play at this high level while staying healthy. Kittle is on pace for his first Pro Bowl selection. He leads the 49ers comfortably in receptions (41), targets (61), and yards (692). He is on pace to break Vernon Davis’ franchise record for single-season yardage, set at 965 yards.